The Affair of the Sonic Weapons Attack in Cuba is slowly but now quite perceptively shaping the contours of U.S.-Cuba relations going forward. Even as the "rest of the West" moves toward engagement following the approach developed by the European Union and the Political Dialogue and Cooperation Agreement (PDCA) (see here and here), the United States has re-framed its engagement along its traditional lines to to emphasize efforts to support the private sector and challenge the public sector (including the governmental apparatus). Almost invariably, and recently, the U.S. seems to draw attention to the Affair of the Sonic Weapons Attack as it continues to develop its policy approaches and objectives. So it is that one can more clearly see the way that the evolution of the investigation of the Affair is now more directly impacting strategic decisions on the extent of U.S. engagement. At the center of this are two now related currents: first the expansion of the scope of the investigations to include children and non-diplomatic personnel from the U.S. and Canada that appear to have been victims of the attacks (e.g., here); and the second is the resulting reaction by the State Department to warn against travel to Cuba. On January 29, 2018, the Miami Herald Newspaper published an article in which it was revealed that the U.S: State Department had been "contacted by 19 U.S. citizens who reported experiencing symptoms similar to those listed in the Travel Warning after visiting Cuba” (Nora Gómez Torres, "19 American travelers to Cuba report symptoms similar to those suffered by diplomats," The Miami Herald Jan. 29, 2018). The story was otherwise vague but did try to connect this ongoing development with the modulations of the travel warning issued by the State Department. In late September, the State Department issued a travel warning advising Americans not to travel to Cuba because they could become victims of mysterious attacks such as those suffered by 24 diplomats and their families while they were stationed in Havana. . . . In January, the State Department changed the wording and currently recommends “reconsidering” traveling to Cuba. However, officials stressed that the situation on the island had not changed, nor their message to American travelers. The list of possible symptoms remained unchanged in the new travel advisory. (Nora Gómez Torres, "19 American travelers to Cuba report symptoms similar to those suffered by diplomats,"supra). Meanwhile, "U.S. officials, however, have addressed the issue at several bilateral meetings held in Washington this month with members of the Cuban government." (Ibid). The connection between warning and negotiations is hard to avoid--but that is hardly a criticism of the U.S. Ironically, it suggests U.S. restraint, considering the additional (and traditionally deployed) weapons the U.S. has in its arsenal. But it also suggests the sort of targeted pressure (in this case on one of the critical sector identified for development in the Cuban long term economic plan) whose use was pioneered well before the start of the term of the present Administration. 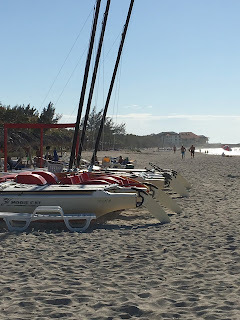 The campaign is appearing to have an effect significant enough to worry the Cubans--and perhaps more importantly U.S. tour operators and the European corporate partners of the Cuban public sector with substantial investments in the tourist sector. But in the past six months, the Cuba travel industry has been hit by a triple whammy of adverse events: U.S warnings and advisories against traveling to Cuba stemming from mysterious health episodes affecting diplomats, a Category 5 hurricane that battered tourism facilities, and confusing statements and restrictions from the Trump administration on travel to the island. (Mimi Whitefield, "American visitors aren’t flying in droves to Cuba now. Tour operators: Please come back," The Miami Herald, Jan. 30, 2018). Even as the U.S: State Department was discussing the wider scope of danger from "sonic attacks", InsigthCuba and other U.S. tour operators seeking to enhance travel demand to Cuba "organized an outing in Havana with the singular purpose of showing that it is safe and legal to travel to Cuba," with the Spanish travel and hotel MNE Melia donating "space at its Melia Cohiba hotel, for the Havana meeting. It operates 27 hotels in Cuba with 12,570 rooms. By 2020, it hopes to be running 38 hotels on the island with 15,548 rooms." (Ibid.). The event had the blessing of the Cuban state apparatus. Cuban tourism officials also joined the Havana media day, distributing guidebooks and promotional materials with the slogan “la vives, la amas” (you live it, you love it), and took American journalists on a tour of Old Havana and Central Havana. (Ibid.). This suggests the extent of the worry within Cuba of the potential effects of the U.S. actions. Yet that worry appears insubstantial enough to produce breakthroughs, even secret ones, between the two states with respect to the "sonic attacks." Yet what emerges from the reporting by Ms. Whitefield is the confused state of play in both U.S. Cuba relations and they way they are playing out in the tourist sector under the shadow of the "Affair of the Sonic Weapons Attack." The Americans have walked back some of the Obama era engagement initiatives, but have not walked back all that many. The new restrictions--when carefully applied--produce substantial loopholes that effectively change less than they appear to (see, e.g., here). The Sonic Weapons Attack supplies ammunition for a rhetoric that produces travel warning and recommendations, but no stronger measures. The U.S. warns but does nothing to make it harder for the U.S. travel sector to seek to enhance Cuba travel even by working closely with the Cuban state. The Cubans continue to meet with their American counterparts even as they publicly mock the America position on the Sonic Weapons Attack. The scope of the injuries caused by the "mysterious" agency expands--though only mildly and intermittently. And the symbols of that new relationship between the U.S. and Cuba were nicely captured in the recent dedication ceremony in Havana of the copy of a statue of Jose Martí on horseback moments before his death, whose donation had been organized by the Bronx Museum of Arts after the 2014 announcement of U.S. Cuba rapprochement (reported in Marc Frank, Trump casts pall on inauguration of U.S. statue of Marti in Cuba, Reuters Jan. 28, 2018). "The original statue, sculpted by Anna Hyatt Huntington in 1958, was erected on the south end of Central Park and was a gift from the Cuban people before the Communist takeover of 1959." (Reuven Blau," Cuba gets statue of national hero Jose Marti from Bronx Museum of the Arts," New York Daily News (Jan. 28, 2018) ). Just a few years ago, the hundreds gathered for the event overseen by Cuban President Raul Castro would have been in a celebratory mood, but the brief ceremony at daybreak in Havana’s colonial district was a sober affair. . . . 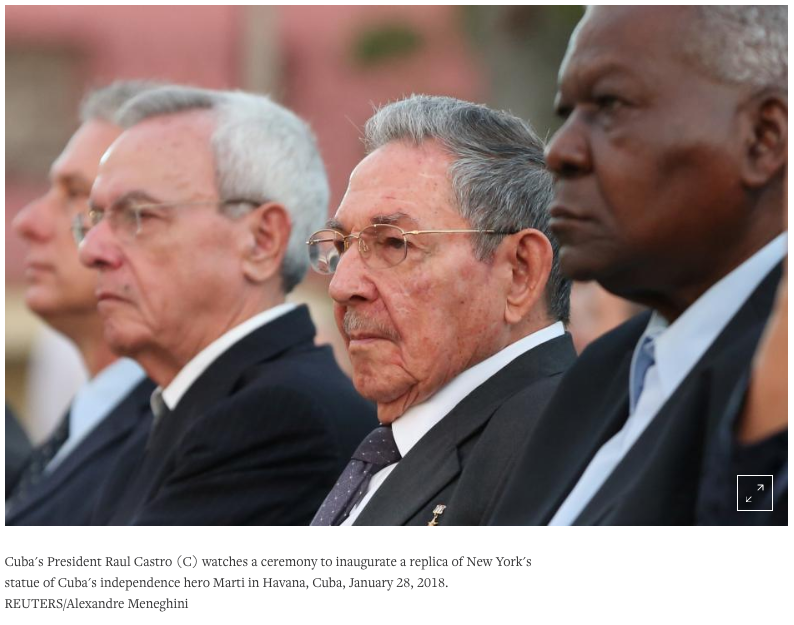 Throughout Sunday’s event, Castro and other officials sat stone-faced. “I was hoping for a party, but since I arrived yesterday, we have all been commiserating over the situation,” said a banker who donated to the $2.5 million project and asked for anonymity. . . . A handful of U.S. politicians and many more businessmen and representatives from the arts and Cuban-American community attended the event, which marked the 165th anniversary of Marti’s birth. Joseph Mizzi, chairman of the museum’s board of trustees, said the statue symbolized the friendship between the people of both countries. A letter was read from New York Mayor Bill de Blasio stating his city was proud of its friendship with Cuba. Marc Frank, Trump casts pall on inauguration of U.S. statue of Marti in Cuba, supra.). Trade, statecraft, human casualties in the name of advancing interests in international relations, and the strategic use of mass media and the levers of hard and soft power all mark the Affair. There is likely more to come, though it is hard to imagine a direction other than one that leads to exhaustion by repetition and disclosures of marginal tidbits. It is what is going on behind the scenes that produce the seemingly contradictory public actions of the actors that would be far more interesting.